Jim Downing Turns 104 Today! Today Jim Downing, Navigator #6 and survivor of the attack on Pearl Harbor, turns 104. I’ve had the privilege to work with him more since I joined the communications department last year. He’s an incredible man of God with a fascinating life story. You can learn more about him on his new website. 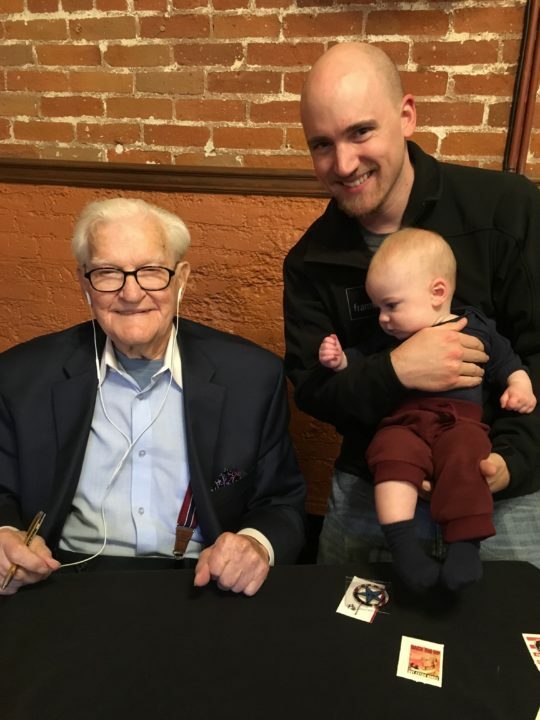 This photo is of Jim, me, and my son Benjamin at a book signing this past November. Jim is the author of “The Other Side of Infamy” in which he recounts his experiences at Pearl Harbor and what it means to follow Jesus in the most dangerous of times. You can pick it up on the NavPress website. I’ve been in my new role as strategic communications manager for just over four months now. It has been a smooth transition, and I’m happy to say that I really enjoy my new job! I’m part of a great team, the work is challenging (in a good way), and I’m looking forward to what is on the horizon for me later this year. One of the projects I’ve been working on is the creation of the new navigators.org website. It has been several years since its last refresh, and we’ve decided to rebuild it from the ground up. We’ve hired an outside firm to design its look and develop its features. My role is to put myself in the shoes of someone visiting our new site and determine how we can give that person the very best experience during their time there. It’s fun to envision ideas and talk through how they could be implemented in practical ways. We’re projecting that the new website will go live in June. I can’t wait for you to get to see it! UPDATE: The new website is now live! I have exciting news to share with you today. I have accepted an offer to become the new strategic communications manager for The Navigators! In this role I will be developing the strategy for the overall Navigators web presence, including the official Navigators website and blog. Additionally, I will be offering assistance to staff who are developing their own communication strategy. I am excited to get to work with staff who are serving not only on college campuses but on military bases, in neighborhoods, in churches, and around the world! 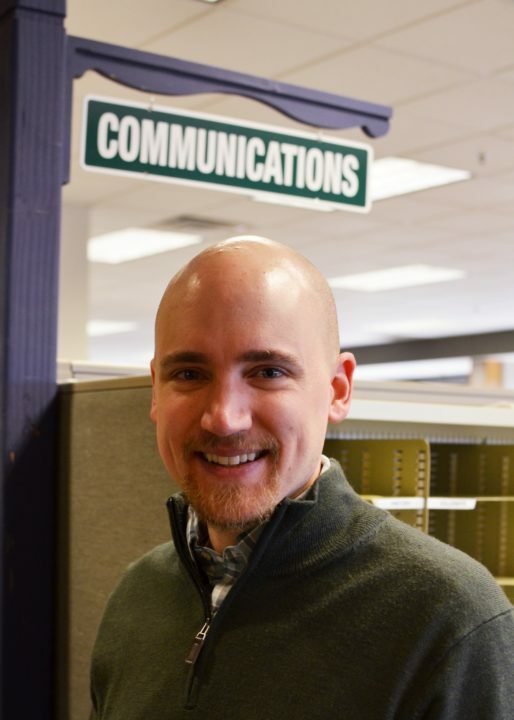 Taking this position means joining the Communications Department and leaving the Collegiate mission. I’ve been on staff with the Collegiate Navs for nearly 10 years, so this was not an easy decision to make. I will miss getting to serve alongside the other members of the National Collegiate Office who have become such good friends of mine over the past three years. Will you need to raise financial support in order to take this position? No, I do not need to raise any financial support to fund my salary. Do you plan to fundraise for anything else? Yes, I will continue to fundraise for film projects such as the Harvest Film Series. When do you begin this new role? My first day on the job will be Monday, November 14. When we were first asked to come to Colorado from Florida to serve at Navigator headquarters Kathy and I could clearly see God’s hand in the circumstances that brought about that opportunity. We see Him leading us very similarly now. We make this move in faith that the Lord is going before us. Thank you so much for your encouragement and support! I will share more with you in the weeks and months ahead. I’m excited to have you continue the journey with me as I take on this new role. I am thrilled to share with you today the third installment of the Harvest film series! In this episode Dave Wirgau examines Hebrews 10:24-25, breaking down the “let us” statements in those verses to illustrate three hallmarks of biblical community. Dave discipled me while I was a student at Florida State University. He continues to serve with The Navigators at FSU, now ministering specifically to international students. He’s a gifted teacher and public speaker, and I’ve been very blessed to have him be a part of this ongoing film project. If you’d like make a tax-deductible donation toward the production of future episodes of Harvest you can do so on this page at navigators.org. Let me know what you think of the video in the comment section below. If you enjoyed it you might also want to check out the first two episodes: Casting the Vision of Discipleship and To the Ends of the Earth (The Archer Illustration). This is Travis, a member of my Collegiate communications team here at headquarters. He’s a recent grad of Texas A&M with a degree in computer science. 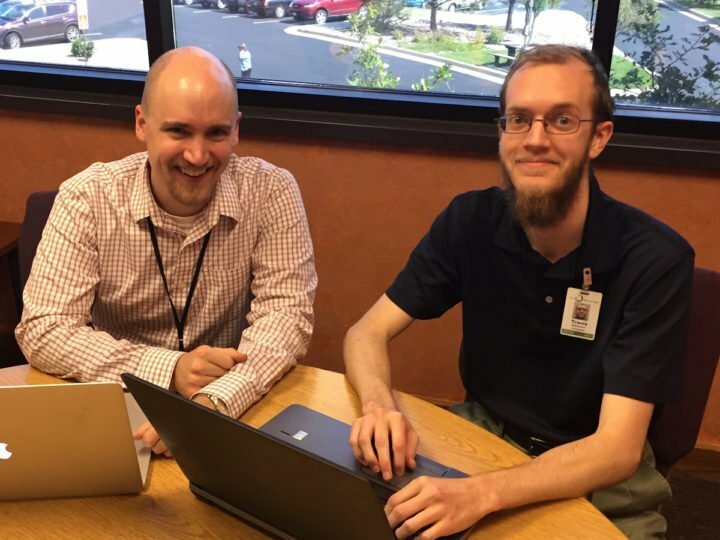 Travis has just started his second year of EDGE Corps (the two year internship program for The Navigators), serving in the National Collegiate Office full time. August marks the start of the fall semester for our Nav campus ministries across the country. My team and I have fielded numerous communication-related questions, many of which have had to do with creating or updating campus ministry websites. Having an up-to-date and compelling website is a key need for our staff as they look to attract incoming freshmen to be involved with their Nav ministry this year. With his high level of technical literacy Travis has done a fantastic job answering a wide range of questions, enabling our staff to start off the year with a strong online presence for their ministries. As the fall semester continues so will the need for technical assistance, largely in the area of online conference registration. I’m so thankful to have someone like Travis here serving The Navigators in such a highly needed capacity. There have been many staffing changes in the National Collegiate Office this year. Perhaps the most notable change for the majority of our staff serving on campuses is that The Navigators Collegiate Ministry has a new director as of June 1. But even more significant to me personally is the departure of my supervisor Mike Kozlarek. This month Mike began a well-deserved sabbatical that will run the rest of 2016. 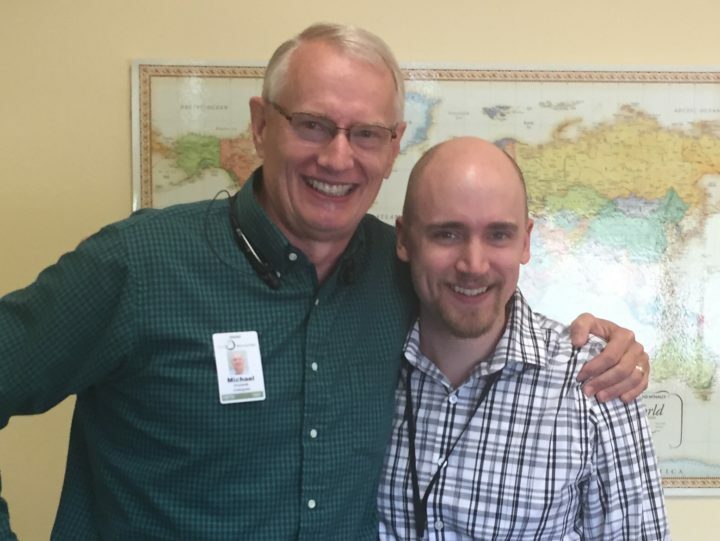 When he returns in January he will be taking a new role in NavMissions, the overseas missions arm of our ministry. Mike has easily been one of my biggest advocates in The Navigators over the past three years. That span includes the months prior to when I accepted the position I’m in, a position which didn’t actually exist when I was pursuing it. He persuaded our leadership to take a chance both on me and the whole idea of having a communications director. Kathy and I have loved being on this adventure here in Colorado, and we recognize that the Lord used Mike greatly in making this all possible. Since I started my job at Nav headquarters two Februarys ago Mike has continued to extend his influence as a veteran Navigator staff to promote my ideas and vision to others on my behalf. I can honestly say that the majority of my initiatives would have gained far less traction without his efforts. I’m excited God is launching Mike into a new season of ministry! Please join me in praying for him and his wife Dana, for their sabbatical time to be refreshing and for his transition next year to be a smooth one.